Porvair Sciences has announced that it will launch an exciting new microplate for genomics sample preparation at the forthcoming Analytica 2016 exhibition in Munich, Germany. Designed with thickened walls and strengthened ribs underneath to stop cracking or leaking when used in Geno/Grinder or Tissulyser machines the robust 96-well 2ml deep well Genomics Sample Preparation Plate sets a new standard for high throughput genomics sample preparation. Unlike most commercially available deep well plates, the Genomics Sample Preparation Plate has been proven to withstand demanding applications using steel ball bearings in the wells shaken at up to 1500rpm used to homogenise seeds, leaves or tissue ready for DNA extraction. Manufactured from superior grade, ultra-clean polypropylene samples the new Genomics Sample Preparation Plate has been tested at the National Centre for Mass Spectroscopy Excellence at Swansea University (UK) and has been found to be free of measurable leachates / extractables as determined on their most sensitive time-of-flight MS instruments. 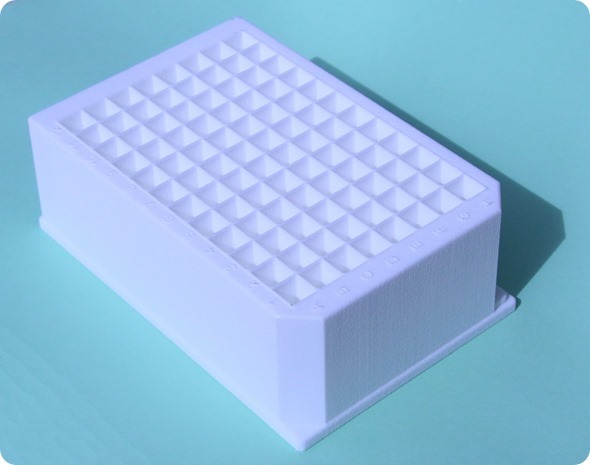 Genomics Sample Preparation Plates are sold individually or as part of a package including matching silicone impact support mat and EVA cap mat. Also at Analytica 2016, Porvair Sciences will show its latest products that enable Lab Automation facilities to optimise sample preparation and improve productivity. These include the Ultravap Mistral – a product designed to remove the traditional laboratory ‘bottleneck’ of solvent evaporation from microplates, the Universal Robotic Manifold for productive automation of SPE or DNA clean-up procedures and the MiniSeal Plus electronically controlled thermal sealer developed for laboratories sealing small to medium batches of microplates. At this important meeting – Porvair Sciences will also be showing a selection of its comprehensive range of applications optimised microplates.